I’m an absolute beginner, and the happy new owner of an Etherwave Standard! It came as a kit, and since the last few weeks since I assembled it I’m playing a bit with it, trying to get familiar with the instrument. And I soon will start to learn properly. But in the meantime, I miss or or two little pieces of equipment. I’m playing with headphones (and will be 99% of the time). For now, I’m using some desktop speakers for the computer. They have an in-jack cable and a out-jack socket, so it is perfect to plug my headphones. But it also a bit big and I need to put them on a chair next to the theremin, so I’d like to upgrade to something more practical. In the short term, I’d like to find a little headphone amp. I saw things like the Behringer HA400. It’s nice but a little big maybe? I don’t need four headphones and that is one thing more to plug on the network. Also I don’t know where to put it? People that have one, can you just have it lying on the theremin? Or are there some accessory to clip it on the mic stand used for the theremin? The other thing that will be missing is a little adapter to turn a mono jack into a mirrored stereo jack? Does that exist? What do you use? In the longer term, I would honestly just like to have a headphone socket on the theremin itself. I don’t mind hacking a little inside, as long as it just soldering things and making holes and that I’m sure it will work. Are there known mods for adding a headphone jack? I think I saw one to turn a Standard into a Plus, but that is honestly too much: the only part of the Plus I’m interested in is the headphone jack. In addition, I will perhaps add some day a Pitch Extention module, so any mod should be compatible with that one too. Or maybe it is just possible to encase something like the Behringer inside the instrument itself? It works quite well. I think other manufacturers have essentially the same offering and just brand it differently. I had to put rubber feet on the bottom of it to keep it from moving around. You can use a mono to stereo adapter plug at the input as there is unfortunately no mono button. Before that I was using a Presonus HP4 which I would not recommend, way too much gain, one channel popped on me, and the thing literally burned up one day filling the house with the acrid smell of toasting circuitry (glad I was home at the time). Thank you both of you for your replies! I had to put rubber feet on the bottom of it to keep it from moving around. And then do you keep it simply on top of the instrument itself? Or can it interfere with the antennas? You can use a mono to stereo adapter plug at the input as there is unfortunately no mono button. Yes I’m going to look into these. Are they one little piece like a jack diameter adapter. If you use only headphones for rehearsals - you can use the audio output jack. I tried that but the volume is quite low, clearly too low to play comfortably. 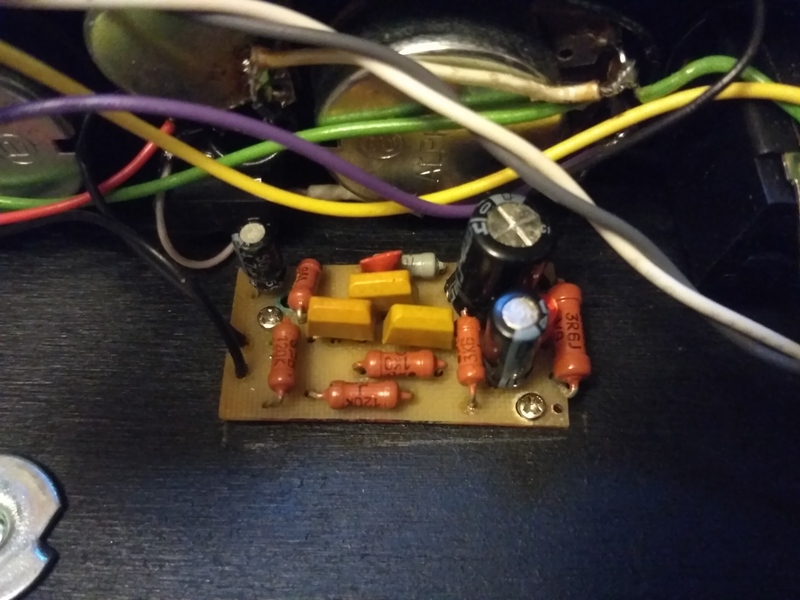 If you mean a preview of the tone - you need to connect an additional headphone amplifier, which you need to mount into the theremin body and make it an additional volume control and headphone jack. It’s not the first time I read about “tone previewing”, and I’m not sure what it means exactly. What does that refers too? But yes, the modification you describe seems exactly like what I would like to do eventually! Is there are resource somewhere about how to make it? Is is entirely custom made or based on an existing amplifier? and the very simple circuit for a headphone out. I’m going to look into it more deeply, but this seems definitely like what I’m looking to do. It only amplifies what would otherwise come out of the current jack, right, the sound will be the same otherwise? Do you think it is compatible with adding a Pitch Extention module as well? frankly, i haven’t built any of those, i was too lazy and bought a field-upgrade, wich includes all that. yes, the pitch extension and those add-ons from the manual use the same pads at the back of the board. but i don’t think that this could cause any trouble. the sound remains the same. but the espe module changes the timbre. btw. : the main-board schematic is for the older boards, but more or less it’s still the same. nclm, I'm glad you liked my design. In the ETW standard there is no amplifier for previewing the tone. It must be assembled and added to existing components. Preview tone is necessary in order to constantly monitor changes in tone. And it does not depend on the level of the volume loop. You need to turn on the sound in the right places, hearing the right tone. The design of this small amplifier can be any. The main thing is that it worked well and was small. It must be built into the ETW standard box. In addition, on the front panel you will need a headphone jack for previewing the tone and adjusting the volume of this amplifier. I came up with my design and it takes up very little space inside. Great, I’ll do something like that! But not as a tone preview, but just amplifying what goes out of the jack normally. In the meantime, I ordered an external Behringer MA400 — I like that it has two inputs and a mono switch. It means I can practise the theremin along some music from the computer, and I don’t need an extra stereo-mono converter. I am not hundred percent sure it is fitting, but I’ll try and let you know. I will also hack a little thing to be able to clip it on the mic stand the theremin is on. So I just got the Behringer MA400 and quickly tested it, it seems perfect! I have the theremin plugged on “Mic Input” (with a jack to XLR cable, that one), and then I plug my headphones on “Phones” (there are sockets both for 6.3 mm jack and 3.5 mm mini-jack). 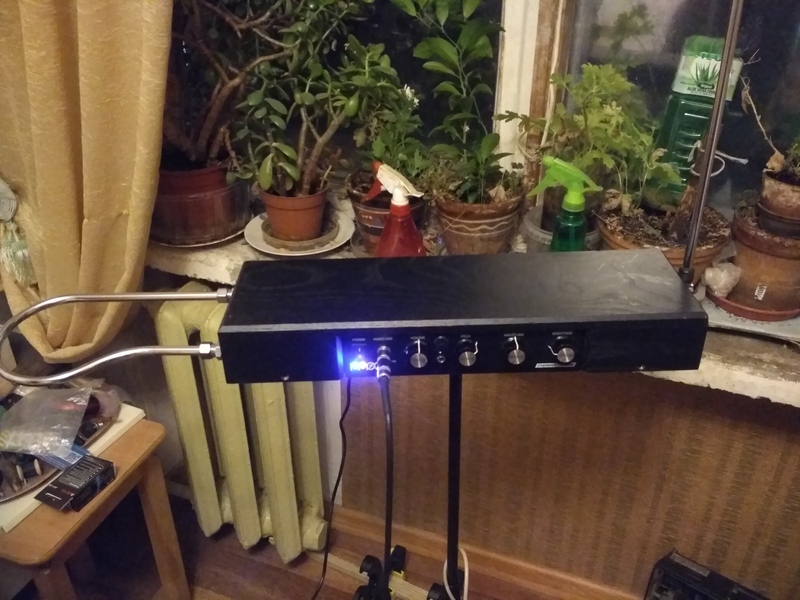 It works and put the theremin sound at a good level! There is a “Mic Level” knob to control the volume. 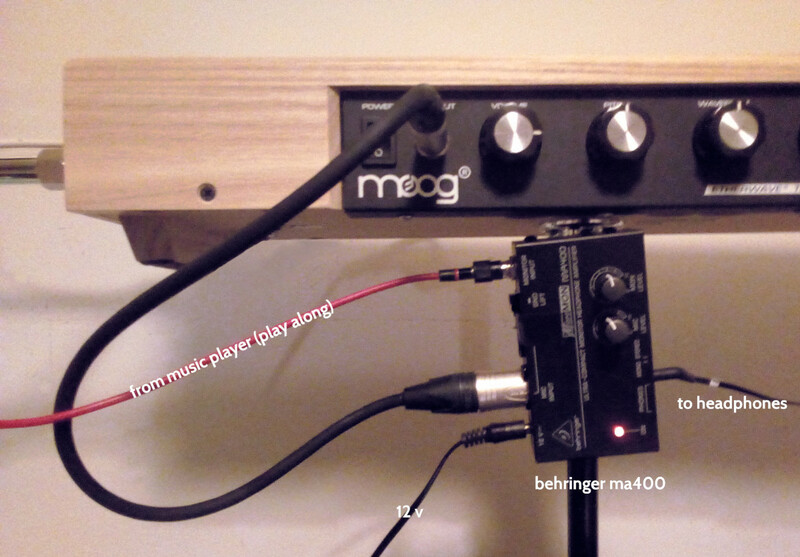 The other thing I can do is plug my computer or a phone or a music player in “Monitor Input” and play along an existing track, both the theremin and the track get mixed in the input! There is a “Mon Level” knob to control that level independently. I’m quite happy about it. I’ll try properly this week-end, see if the sound quality is all right etc. Next step is making a nice support to clip it to the mic stand (in the picture it is just taped).